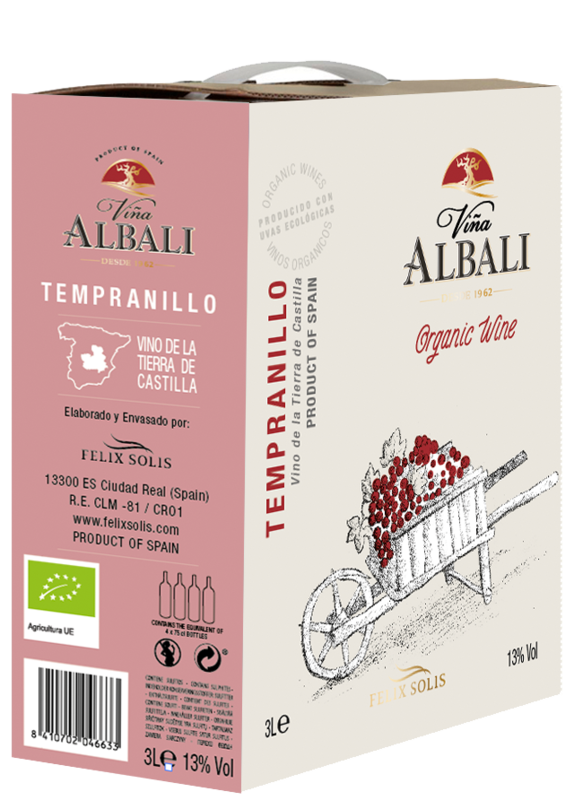 Viña Albali Tempranillo – Organic Wine Bag in box 3 L.
Viña Albali Tempranillo Organic Wine is made from a carefully selected tempranillo organic grapes hand-picked from our vineyards. This type of wine is made from grapes grown in accordance with principles of organic farming, which typically excludes the use of artificial chemical fertilizers, pesticides, fungicides and herbicides. This bag-in-box wine is easy to carry and store and will keep your wine fresh for up to six weeks after opening. Deep cherry red in colour with aromas of strawberries and fruits of the forest, this is a smooth and well-balanced red wine. A perfect accompaniment to meat or game dishes or paté.